Q:Are these a set of 2 sold together? I.e. Entering a quantity of 2 is ordering 4 vases. A:These are sold individually, but we require a minimum of 2 vases for purchase. Please enter "4" for 4 vases. A:The dimensions on this page specificity that the product is 3.7" in length. 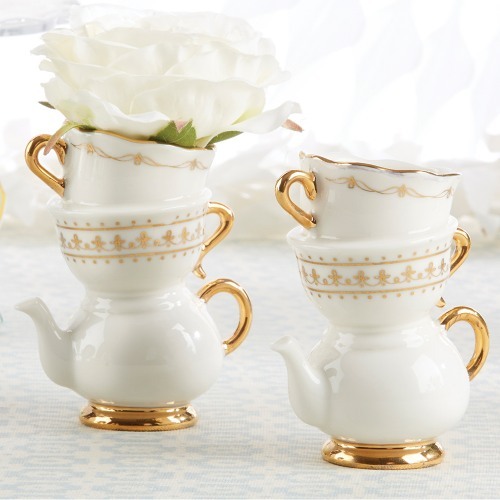 Add whimsical charm to your tea party bridal shower with these stacked teacup bud vases. Each vase is designed to resemble two vintage teacups stacked on a teapot and features gold foil detailing over a white base. Just add your favorite flowers and set along the tables for memorable and beautiful decor.